Odds are, you've seen the adorable C.C Beanies floating around the internet, or even in shops. They're a knit hat that feature a fun bumpy texture, and look so chic and comfy. So with fall upon us I really wanted to create a crochet version of this hat. I also wanted to challenge myself to make it look as "knit" as possible, and I think I achieved what I set out to do! I will start by saying that this hat does take a bit of time, compared to other crochet hats or projects you have done. Because to achieve the "purl-like" look I had to include the slip stitch, which can be time consuming. And the other stitch - a back post half double crochet, is quite the yarn eater. So you'll need more than the average amount of yarn you may use for a hat. Just thought I'd throw that out there! I do think the results are well worth it... This hat is incredibly comfortable, and I'm in love with the look of it. It stretches quite a bit, and fits like a "slouchy" hat, which I love. And doesn't it pair nicely with a cute casual outfit?! The hat is designed for a women's head, but it is definitely forgiving in size. Because like I said above, it's very stretchy. To achieve the look I wanted for the hat, I had to use two different sizes of crochet hooks-which was very... different for me. But I thought it was necessary to get the look I was going for. The hat is also worked on the wrong side! So please forgive me for the very weird ways of making this hat- trust me I realize the instructions are strange, but I really wanted that knit look, ya know?! And to achieve it, you just have to do weird things. ha! All that said, I wouldn't recommend this pattern for a beginner crocheter, it's just a tad complex. Optional: Fur pom - I did a tutorial on how to make your own found here. -The hat is worked from the WRONG side after you finish the band. You will turn it around once complete. -When slip stitching you must work stitches VERY loosely. It's easy to work those tightly, so have a loose hand when making those-- that's part of the reason why I chose to use a bigger hook. -Below are two photos showing what loops you work in for the band of the hat. 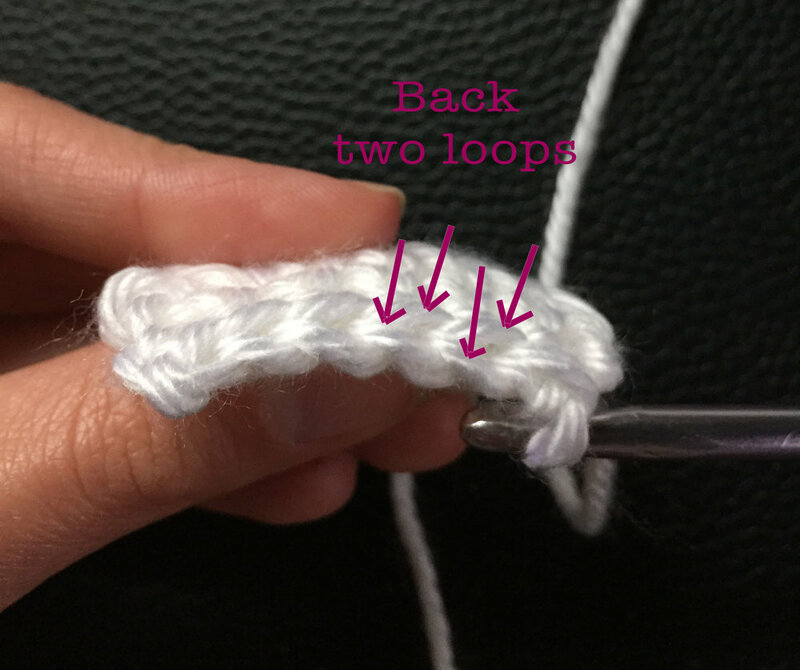 The back loops can be found when you turn over your work a bit. Finish off, and leave a long tail to sew up the end of the hat. 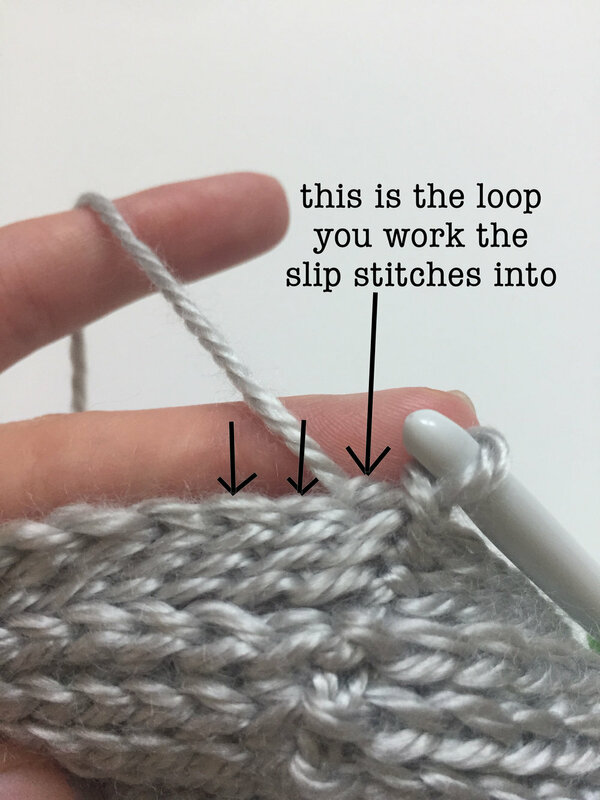 To sew up the end of the hat, you will take the tail piece of yarn and yarn needle then make a loose running stitch along the last round of your hat. Use long strides with your needle, so it can gather nicely. Once you've gone all the way around, gather the hat by pulling on your tail piece of yarn until it is all gathered. Above is a photo of the hat being "secured" after already being gathered. Then you can add a pom if your heart so desires! I did a little tutorial (found here ) on how I made my own faux fur pom. It was surprisingly very simple! If you have any questions regarding the pattern, feel free to leave them in the comments below. I will try to get to them ASAP! And if you end up completing one of these beanies, do please share with me by tagging me over on Instagram! It would make my heart so happy! !